Food writer and clinical psychologist Scott Haas wanted to know what went on inside the mind of a top chef—and what kind of emotional dynamics drove the fast-paced, intense interactions inside a great restaurant. To capture all the heat and hunger, he spent eighteen months immersed in the kitchen of James Beard Award-winner Tony Maws’ restaurant, Craigie on Main, in Boston. He became part of the family, experiencing the drama first-hand. Here, Haas exposes the inner life of a chef, what it takes to make food people crave, and how to achieve greatness in a world that demands more than passion and a sharp set of knives. A lens into what motivates and inspires all chefs—including Thomas Keller, Andrew Carmellini, whose stories are also shared here—Back of the House will change the way you think about food—and about the complicated people who cook it and serve it. Author Scott Haas had the unique job of being a food writer in addition to being a clinical psychologist. I'm not sure how much more I need to say to set up this incredible story of a powerhouse Boston/Cambridge restaurant. Haas had the ability to interview any person in the restaurant, from server to line cook, at any time, any day. For someone outside of the industry, this is a great view into how a majority of kitchens work, as well as how a chef's mind works. 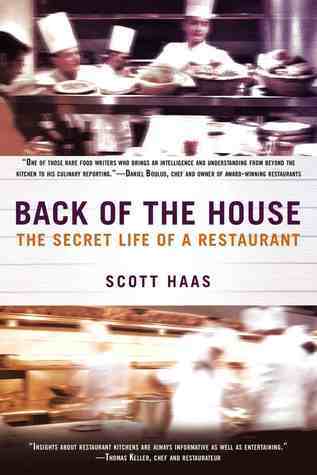 Haas analyzes not just the mindset and functionality of the kitchen and restaurant, but of Chef Maws himself. This work is one of the freshest and most unique in the food writing spectrum. If you've ever been to a restaurant and had a unique dish or have even watched 5 minutes of food television and asked, "I wonder what is going through his/her head?" this book is definitely for you. Wow, thanks for the GREAT review!! !